Thank you. I don’t know who you are and most probably, not a lot of Filipinos do, but I’m pretty sure all of us want to thank you. Without you, we, all the current and past Philippine plus size brands, would not be here serving the needs and wants of Filipina plus size women, making them happy with their bodies. I hope that all the good karma is treating you well. You deserve it. Yesterday, we had a new Erzulliesta and she just told me, “Oh my gosh! This is monumental! 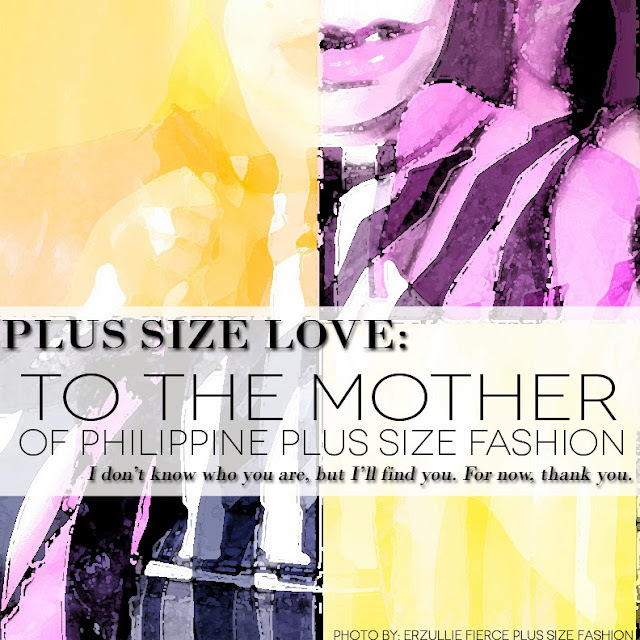 This is my first plus size fashion!” We were very happy that the brand was her first purchase into the fabulous world of Philippine plus size fashion, but it also got me to thinking --- who was mine? Brands in my mind were Moda Plus, TBY, Circles, Get Laud, Kai Plus, Kamiseta (they have extended sizes). But after a lot of reflection, my actual first plus size fashion brand was, “She”, which is unfortunately, closed. Last 2007, I bought a brown military jacket from them that until now I use and share with Berna. But even beyond that year, I am sure there were other plus size brands that existed. So who was the first mother of Philippine Plus Size Fashion? Hopefully, I get time to research about it, but for now, as inspiration runs through me, whoever it is --- Thank you, Mother. You started rolling the ball and now we all exist and more of us will be, in the future. Thank you and we love you!